So much of the “success” of a food blog lies in its photos and the photography skills of the blogger. Sites like Pinterest and Foodgawker are replete with mouth-watering images of food that captivate viewers. While that photo draws you in, it may or may not provide much information on the content or flavors of the food. Today, I’m taking a risk, and bringing a “few words” about the value of cooking without recipes using flavor profiles, and taking my focus away from recipes and photos… I hope that you will find this post interesting and useful. I have periodically mentioned the way I use flavor profiles in menu planning and recipe development. In combination with my well-stocked pantry, I manage to spend less time at the market, and keep mealtime varied and interesting. I more efficiently use ingredients I have on hand. For example, if I’m making my Miso and Orange Glazed Roasted Chicken, I could just do a tossed salad or some steamed green beans to go with it. That would certainly be a healthy and nutritious meal. But in understanding flavor profiles, I know that I can kick this “up a notch” by making a side dish that complements the flavors of my roasted chicken. The chicken is glazed with a mixture of miso, orange juice and zest, tamari, rice wine, sesame oil, ginger, garlic, and sriracha. Instead of a standard green salad, I might do a shredded napa cabbage slaw with a sesame ginger vinaigrette, sugar snap peas, and red pepper strips. Conversely, I frequently have haricots verts (young, thin green beans) on hand. 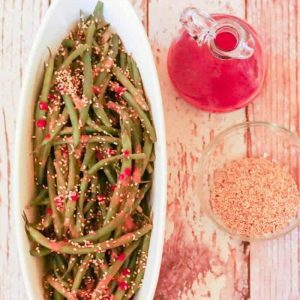 Rather than run to the market for the napa cabbage, I might steam those green beans, and toss them with a sriracha, sesame, and ginger dressing, like I did for my Spicy Sesame Green Beans. 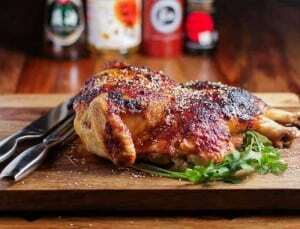 So, how does a home cook rely less on recipes and learn to cook by “flavor profile?” I always suggest picking a couple of your favorite regional cuisines first, be it Italian, Chinese, Indian, Mexican… Learn the basic flavors that define that cuisine, and begin to incorporate those flavors into your cooking. An easy way to start is with your salads. Salad dressings and ingredients are so easy to customize to complement a main dish, or even stand alone as your main dish with by incorporating a protein source. How would I put together a meal using my knowledge of the Mexican/southwest flavor profile? Given that I probably have boneless, skinless chicken breast in my freezer, all of the spices and staples in my well-stocked pantry, and several of the fresh items in my refrigerator, I come up with a lovely, southwest-inspired meal. The menu looks something like this: Chicken Breast marinated in lime juice, olive oil, garlic, cumin, and chipotle chile, green rice (flavored with cilantro and green salsa), and my Cilantro-Jalapeño Ranch Dressing (With a Southwest Salad) – a tossed salad with grilled corn, black beans, avocado, tomatoes, and a cilantro and jalapeño ranch dressing. I didn’t pull out a cookbook, or search for something on the internet. 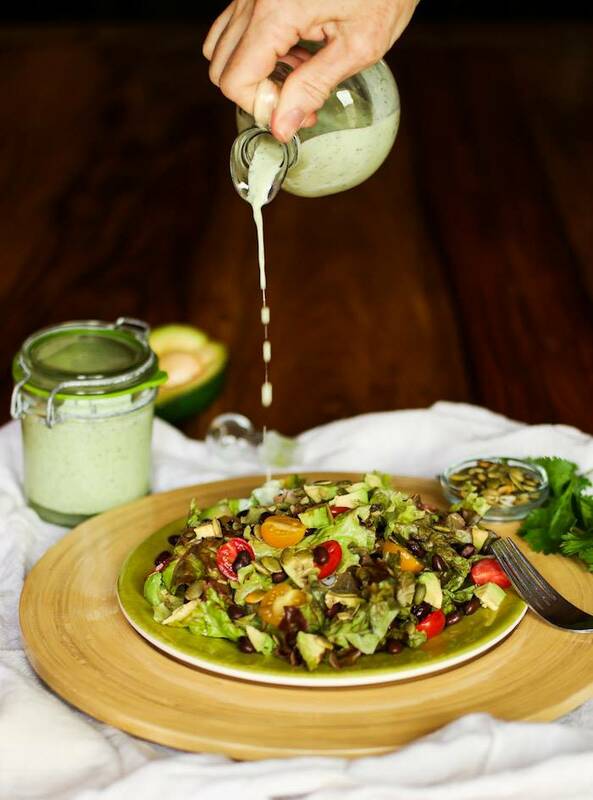 The salad dressing would be the biggest challenge without a recipe, but once you’ve learned the basic proportions of salad dressing ingredients, you don’t really need a recipe to create them. Keep in mind that learning to use flavor profiles to create a meal probably won’t recreate abuela’s chile colorado, but it will free you from recipe books, and allow you to cook interesting and varied menus. If learning to cook without recipes is appealing to you, I highly recommend learning more about flavor profiles. I recently compiled a summary of those I use the most often. See Flavor Profiles. If you haven’t downloaded my customizable Pantry Checklist, you can find it under Cooking Helps as well. As always, I am more than happy to provide feedback, advice, and help as you continue your cooking journeys. Does this idea seem intriguing, helpful, or overwhelming? I would love to know your thoughts! I agree completely! It's always good to have an arsenal of ingredients you know work with a particular cuisine, or style of dish. As a baker, I love cooking because you don't need to have exact measurements with absolutely everything! It's nice to be able to have that flexibility and experiment! I really like the flavor profile approach, as much of my cooking is done that way--although I never gave it a name. In reading through the Chinese flavor profile, I was surprised by the absence of Chinese Five Spice, which I think is foundational to stir-fry dishes. I think it would be a worthwhile addition to the profile. Hi Dad! Now you have a name for what you do :-) I will add 5 spice to my summary page... I do keep it in my well-stocked pantry, but don't use it as frequently as some of the more basic flavors. Thanks for your comment! Oh Tamara, I love, love this post! In the end, this is the ultimate cooking skill....to be able to come up with a dish without a recipe and nail the flavors in the same time. What is a polish photo when the flavors are not working... I cannot wait to read your summary. I am trying to learn Mexican flavors this summer. Pretty sure I will find a lot of useful info. Thanks for sharing it!